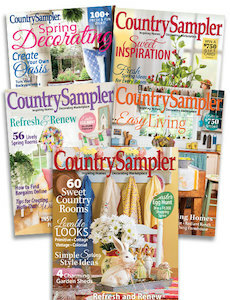 Save over $19.00 off the cover price when you order this special collection of Spring-themed issues of Country Sampler. In these five wonderful issues you will find spring style makeovers, fun & functional family spaces, dreamy country looks, and fresh garden accessories. Order this 5-pack today and get ready for spring-time! Issues in this pack include: Country Sampler March 2015, 2016 & 2017, Country Sampler May 2015 & 2016.